My sixth "century" of comets began with this object, discovered on CCD images taken February 11, 2012 by amateur astronomer Fred Bruenjes of Warrensburg, Missouri, his first (and, thus far, only) comet discovery. I first observed it on the evening of February 12 as a diffuse object of magnitude 11 1/2, and saw it on a couple of additional occasions over the course of the subsequent week. The comet was traveling in a retrograde orbit distinctly backwards to that of Earth (inclination 163 degrees), and had already gone through opposition during the latter part of January; on January 27 it had passed 0.19 AU from Earth. I somewhat suspect that it might have undergone an outburst shortly before Bruenjes' discovery, since it should have been somewhat brighter than its discovery brightness when near opposition and thus could have been discovered by one or more of the various surveys. Moreover, despite approaching perihelion it seemed to fade and diffuse out quite rapidly, and appeared as little more than a vague diffuse glow of magnitude 12 1/2 when I saw it for the last time on the evening of February 20. This comet was originally discovered in March 2004 by the Haleakala telescope of the Near-Earth Asteroid Tracking, or NEAT, program (described in "Countdown" entry no. 466, although it is no longer operating). It passed perihelion the following January, and I was able to obtain a handful of observations in May and June 2004 and again in June 2005 as it was approaching its next opposition (no. 351); it never appeared brighter than 14th magnitude. The comet has a current orbital period of 8.1 years, and on its next return it was recovered on November 2, 2010 by E.S. Romas, Artyom Novichonok, and Dmitry Chestnov at the Kislovodsk Mountain Station of the Pulkovo Observatory in Russia, and independently a day later by Gary Hug at his private Sandlot Observatory in Scranton, Kansas. I first observed it on the morning of February 25, 2012, when it appeared as a very small and faint object barely brighter than magnitude 14 1/2, and followed it through its opposition in early April until early June; at its brightest it appeared close to magnitude 13 1/2. After conjunction with the sun in November I picked it up again in the morning sky in mid-May 2013 and followed it until early July; it remained a faint object of 14th magnitude throughout that time. As its "asteroidal" designation implies, this comet initially appeared as an asteroid when discovered by the LINEAR program in New Mexico on October 31, 2011, although the first calculations suggested its orbit was cometary in nature, including being almost perpendicular to Earth's (inclination 94 degrees). CCD images taken in early November by Japanese amateur astronomer Hidetaka Sato with a remotely controlled telescope in New Mexico and also by Jim Scotti and Terry Bressi with the 1.8-meter Spacewatch telescope in Arizona, and later on by other astronomers elsewhere, revealed that the "asteroid" 2011 UF305 exhibited a coma and a short tail, and it was subsequently announced as a comet. I first picked up the comet on the morning of March 22, 2012, when it appeared as a small, condensed object of 14th magnitude located three degrees west of the bright star Deneb in the constellation Cygnus. It traveled northward from there, passing less than five degrees from the north celestial pole in late May, by which time it had brightened to magnitude 13. The comet reached a peak brightness close to magnitude 12 1/2 in mid-June, and had faded slightly from this by the time I obtained my last observation a month later, after which it sank low in the northwestern sky as it approached conjunction with the sun in mid-August. Of all the comets I've observed in my life, this one turns out to be one of the brightest I've ever seen in terms of total magnitude, however its close proximity to the sun at the time it was brightest kept it from becoming a "Great" comet. It was discovered on June 6, 2011, by the Panoramic Survey Telescope and Rapid Response System (Pan-STARRS) survey program based in Hawaii. Pan-STARRS, which at present utilizes a 1.8-meter telescope on Mount Haleakala, went on-line in May 2010 and discovered its first comet, P/2010 T2, a few months later; C/2011 L4 was its second comet discovery. The program has since become quite adept at discovering comets, having found forty more by the time I last observed this comet. Most of these have been very faint objects. Comet C/2011 L4 was, like almost all the Pan-STARRS discoveries, quite faint at discovery, being about 19th magnitude, however its small perihelion distance created much speculation that it could become quite bright. Once detailed calculations revealed that it was likely a comet from the Oort Cloud making its first visit to the inner solar system, these speculations began to dampen somewhat, although it was also found to be a rather dusty comet, which suggested the overall display could be at least somewhat spectacular. After a couple of unsuccessful visual attempts I managed to observe Comet PANSTARRS for the first time on the morning of March 30, 2012; at that time it was almost a full year before perihelion passage, being located 5.13 AU from the sun and 4.65 AU from the earth, and appeared as a small condensed object just fainter than 14th magnitude. Over the next few months it tracked slowly westward across Scorpius (passing less than one degree north of the bright star Antares in mid-May) and went through opposition during the latter part of May, by which time it had brightened to magnitude 13 1/2. I continued to follow it for the next several months as it moved into the western sky, and it appeared close to magnitude 12 1/2 when I obtained my (temporarily) last observation of it shortly before mid-September. Because the comet was located south of the sun, observers in the southern hemisphere were able to follow it for about another month, during which it brightened an additional magnitude or so. After conjunction with the sun (13 degrees south of it) shortly after mid-November, the comet again became accessible in the morning sky to observers in the southern hemisphere just before the end of 2012, being about 9th magnitude. According to reports from that part of the world it brightened steadily thereafter, being about 7th magnitude in late January 2013, between 5th and 6th magnitude in mid-February, 4th magnitude late that month, and close to 2nd magnitude in early March. It remained at a fairly small elongation throughout that time, being again in conjunction with the sun (30 degrees south of it) shortly after mid-February, with the elongation continuing to decrease thereafter as the comet headed almost due north. I first picked up Comet PANSTARRS again on the evening of March 10, when it was located only 15 degrees due east of the sun. In the bright sky I could not see it with my naked eye, but it exhibited a bright dust tail in both binoculars and a telescope, and appeared close to magnitude 1 1/2. Two nights later I was able to see the comet with my naked eye, when it formed a spectacular sight together with the day-old crescent moon. The photograph at right was taken that evening by Mike Holloway in Arkansas (who had been one of my "mentors" during "Countdown"), and it illustrates a cross between the naked-eye appearance and the overall appearance in binoculars. As the comet traveled northward it gradually became easier to see, althought it remained too close to the horizon in twilight to be a spectacular object; it again went through conjunction with the sun (29 degrees north of it) before the end of March. In early April it passed just over two degrees west of the Andromeda Galaxy M31, and by that time had faded to about magnitude 4 1/2, although exhibiting a bright dust tail two to three degrees long in binoculars. By the latter part of April it had entered northern circumpolar skies, by which time it had faded to about magnitude 7 1/2, and in late May it passed less than five degrees from the north celestial pole. Throughout this time, meanwhile, it began to exhibit a distinct anti-tail, that gradually lengthened as the earth approached its passage through the comet's orbital plane near the end of May; around that time I was able to trace this anti-tail up to a length of four degrees in binoculars, with the comet's overall magnitude being about 8 1/2. Since that time Comet PANSTARRS faded steadily as it receded from the sun and the earth, and appeared as a rather vague and diffuse object of magnitude 13 1/2 when I obtained by final sighting on the evening of September 30 -- a span of just over 18 months from the time of my first observation. Around the mid-point of 2012 I was hit with some rather disturbing and distressing events in my personal life, which among many other things rather severely affected my observing of comets for pretty much the rest of the year. Although I didn't entirely stop comet observations during this time, my rate and frequency of observing was significantly curtailed. In addition to this, our annual summer monsoon season here in New Mexico cut back my observing efforts even more during July and August. Shortly before mid-July I noticed a rather bright object that was listed on the Minor Planet Center's Near-Earth Object Confirmation Page. This object had been discovered on July 13 by the La Sagra Sky Survey, a semi-automated sky survey program run by several amateur astronomers in Spain, and which thus far has produced numerous near-Earth asteroid and eight comet discoveries since 2009 (the best-known discovery being the small asteroid 2012 DA14, which one year later passed extremely close to Earth in mid-February 2013). Shortly after midnight on July 14, under mediocre sky conditions I detected a very faint and somewhat fast-moving object in the expected location; it appeared mostly stellar, although it seemed to have a trace of diffuseness associated with it, and I believed that the NEOCP object was a comet. However, later that day the Minor Planet Center announced the discovery as an asteroid, designated 2012 NJ, and it became obvious to me that the "diffuseness" I thought I had seen was almost certainly due to thin clouds I was looking through at the time. I saw the object again the next morning under distinctly better sky conditions, and it clearly appeared stellar, just fainter than 14th magnitude. After the early August full moon I observed the comet one additional time, on the evening of August 6; it appeared completely stellar, just brighter than magnitude 14 1/2. I did not look for it again after that. I have a special fondness for this particular comet, which was originally discovered accidentally in August 2001 by Canadian amateur astronomer Vance Petriew while attending a star party in Saskatchewan. At the request of the Central Bureau for Astronomical Telegrams I confirmed the comet (no. 294) both visually and with CCD images the following morning, and was duly credited for such on the discovery announcement. 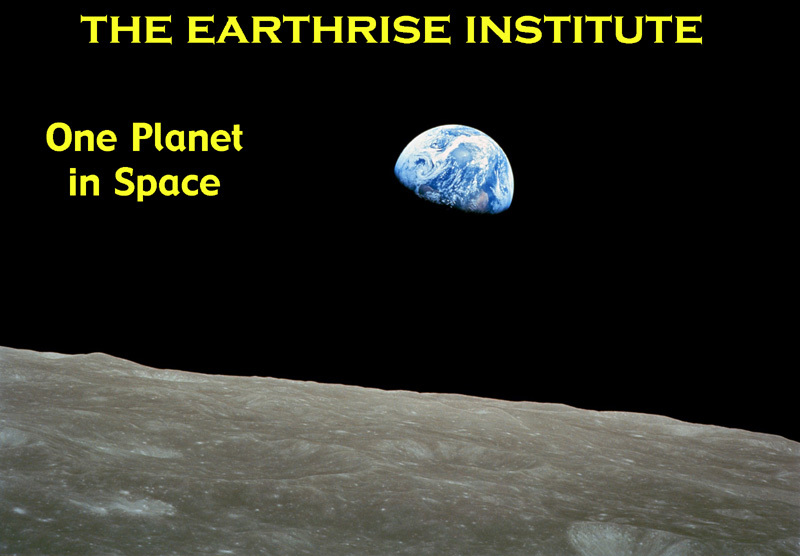 The Earthrise Institute, then operating under the name Southwest Institute for Space Research, was the first institution in the world to obtain astrometric measurements of the new comet. Comet Petriew reached a peak brightness between magnitudes 10 1/2 and 11 the following month, and was found to be periodic (current period 5.5 years). It returned under somewhat unfavorable circumstances in early 2007, and I was able to obtain a handful of observations then (no. 400) just as I was preparing to get "Countdown" underway. On the subsequent return it was recovered on May 27, 2012 by Japanese amateur astronomer Hidetaka Sato utilizing a remotely-controlled telescope in New Mexico. The geometric circumstances in 2012 were similar to, although slightly less favorable than, those in 2001, and the comet's elongation from the sun was never very large. I saw it for the first time on the morning of July 23 (on the anniversary of the Hale-Bopp discovery) after I had returned from a "mental health" trip; it appeared as a diffuse 12th magnitude object. Due to the personal circumstances I mentioned in the above entry I only observed it on a couple of other occasions, the last of these being in late August; the peak brightness of magnitude 11 1/2 seemed to come near the end of July. I discuss this most unusual comet quite extensively in the "Countdown" entry for its 2007 return (no. 405). As I indicate there, the comet was originally discovered in May 1986 by my friend Don Machholz in California, and I was one of the people who confirmed his discovery the following morning. Historically the comet tends to remain faint until shortly before perihelion passage, although a handful of observers in the southern hemisphere were able to glimpse it in late June before it disappeared into twilight. As has been true for the past several returns, Comet Machholz 1 was a rather spectacular sight in the LASCO coronagraphs aboard SOHO as it passed through perihelion, and by about a week later it began to emerge into the northern hemisphere's evening sky. According to several observers who were able to observe it visually around then it was as bright as 8th magnitude or brighter, and it exhibited a rather prominent tail on various images. However, because of the monsoon activity here in New Mexico I was unable to see it until the evening of July 28, when in bright moonlight it appeared close to magnitude 9 1/2. I only saw it on one other occasion, on the evening of August 6 when it appeared about a magnitude fainter. As the comet was passing through perihelion researchers Liang Liu in China and Prafull Sharma in India (a 17-year-old student in Delhi) detected what were apparently fragments of it within the field of view of the LASCO coronagraphs aboard SOHO. The first of these objects has now been officially designated as "Component B" with its own orbit, and meanwhile the second has been formally announced as a separate object designated as Comet C/2012 N1. For the most part, this is another one of the faint, nondescript long-period comets that appear with some regularity on my tally. 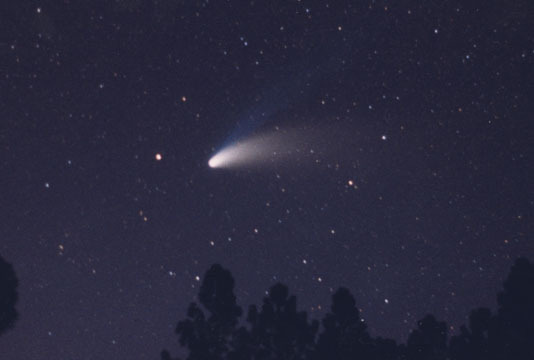 It was discovered on May 13, 2012 by Alex Gibbs during the course of the Catalina Sky Survey in Arizona; as the name "Catalina" implies, it was not immediately apparent from the discovery images that it was cometary. I first saw it on the evening of August 9 as a very faint, small, and condensed object slightly fainter than 14th magnitude, and then followed it occasionally up through the beginning of February 2013. The comet was at opposition in mid-September, and was brightest in December and January when it appeared near magnitude 13 1/2, maintaining its small and condensed appearance throughout this time. It had faded to 14th magnitude, and was starting to get a little bit low in the western sky after dusk, by the time I last observed it. During the course of "Countdown" I wrote numerous times of the Siding Spring survey based in New South Wales and of the exploits of my friend Rob McNaught. As of early August 2013 Rob had discovered 82 comets (at least, those which carry his name), but meanwhile the Siding Spring survey itself has, sadly, had to shut down due to lack of funding. Among the many comets that Rob discovered during the course of the survey was one he found during May 2005. When near perihelion in August of that year I was able to obtain a handful of observations of it (no. 379) as a very faint object of 14th magnitude. The comet was found to be periodic, with a current orbital period of 7.1 years. On its next return it was recovered on May 18, 2012, by Martin Masek at the private Pierre Auger Observatory in Malargue, Czech Republic; he later found the comet on CCD images he had taken three days earlier. The geometric circumstances at the 2012 return were quite favorable, with opposition occuring in mid-October just over a month after perihelion passage, and with a closest approach to Earth (0.58 AU) occurring in early October. I first saw the comet on the morning of August 27, when it appeared as a small condensed object slightly fainter than magnitude 13 1/2; I followed it through early October. It was brightest from mid-September up through the time of my final observation, when it was close to 13th magnitude; despite its faintness I could detect the beginning of what appeared to be a short tail. In addition to the Siding Spring survey that I wrote about in the previous entry, during "Countdown" I also wrote numerous times about the LINEAR program based in New Mexico. LINEAR dominated ground-based comet and near-Earth asteroid discoveries during the late 1990s and early 2000s, however due to the various other surveys that have come on-line recently it is certainly no longer the dominant force it was then. Still, it manages to make its share of discoveries, and during one 17-day period in May and June 2012 it discovered four comets. I would end up observing three of these. The first, and brightest, of these four comets was this one, which LINEAR found on May 25. It was found to be traveling in an orbit almost perpendicular to Earth's (inclination 93 degrees) that bore a superficial resemblance to that of Comet Hale-Bopp C/1995 O1 (no. 199), although there is clearly no relationship between the two objects. The comet was also somewhat notable in that, despite its relative faintness at discovery (17th to 18th magnitude) it was already exhibiting a bright and distinct tail. 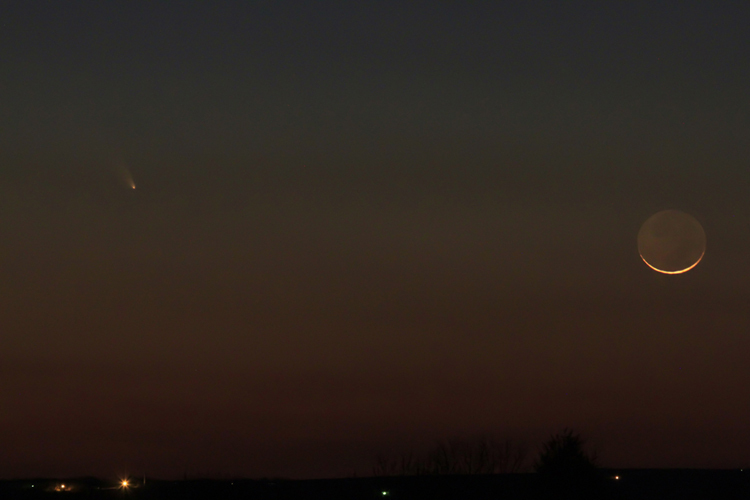 I first attempted the comet shortly before mid-August, but didn't see anything. However, when I next attempted it on the evening of September 10 I had no difficulty in seeing it; despite being 13th magnitude I could readily detect the tail that had been so prominent in CCD images. It brightened steadily during the subsequent months, being about 12th magnitude in October and 11th magnitude in November, and by mid-December it was close to 9th magnitude and I could faintly detect it in binoculars. Telescopically the tail was bright and appeared 15 to 20 arcminutes long. Comet LINEAR passed 0.29 AU from Earth on New Year's Eve. On the following night (New Year's Night, 2013) it was easily detectable in binoculars, appearing at magnitude 8 1/2 with a coma eight arcminutes in diameter. After this it began fading and diffusing out rather rapidly, although the tail continued to remain somewhat prominent; the comet had faded to magnitude 11 1/2 by the latter part of January, and it was only 13th magnitude when I obtained my final observation on the evening of February 11.